Tunis, Tunisia (CNN) -- Tunisia's new government announced Thursday it will recognize political groups banned under the regime of ousted President Zine al-Abidine Ben Ali and grant amnesty to all political prisoners. The announcement followed the first meeting of the new Cabinet formed by the North African country's interim leaders as they and other former members of Ben Ali's ruling party tried to climb from under his shadow. Ben Ali's beleaguered Constitutional Democratic Rally was crumbling amid popular cries to exclude the party in shaping Tunisia's future. The central committee of the party -- known by its French acronym RCD -- was dissolved earlier Thursday, and all Cabinet members who once belonged to the party have quit it. Ben Ali's party suffered a major blow earlier this week when interim President Fouad Mebazaa and interim Prime Minister Mohammed Ghannouchi submitted their resignations, Tunis TV reported. Tunisian ripple effect in Jordan? Those resignations Tuesday followed street protests in the capital, Tunis, that called the new government a sham and demanded that officials with connections to the old guard be fired. Mebazaa has said he plans to sever "any link with the past," referring to the unpopular years of the former regime's authoritarian rule. His government is tasked with leading Tunisia toward new elections. But for many Tunisians, the resignations and promises are not enough. "The Tunisian people don't want this party, this dictatorial party," English teacher Mohammed Basha said. "We want a real revolution. We don't want any more lies, because we are fed up. Twenty-three years of lies." Ben Ali ruled Tunisia for 23 years until the popular rebellion forced him to flee on Friday. The RCD initially formed a consensus government with the opposition, but protesters demanded that members of the old administration -- whom they called "leftovers" -- be swept out of power. "You have to understand that this party is involved in the nitty-gritty of every bit of the administration in this country," said Hadi Benabbas, a school professor. "And they are controlling the people, controlling the way they speak, everything." 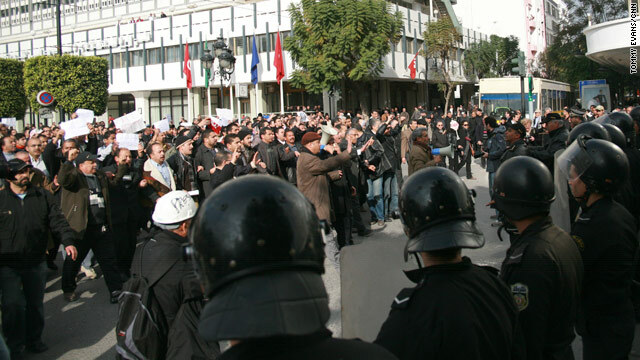 In Tunis, crowds gathered in front of the soaring headquarters of the RCD and cheered the announcement of the party's diminishing status. They shouted approval as the large red metal letters and words that made up the RCD sign were ripped off and tossed off the 20-story glass building. One man wrote "Death to the RCD" on the gate with black spray paint. A sign read: "House of the People's Revolution." The army fired into the air to keep roughly 2,000 protesters at the former ruling party's headquarters at bay, but so far there has been no violence. Ben Ali's ouster followed weeks of protests over what discontented Tunisians said were poor living conditions, high unemployment, government corruption and repression. They were sparked when Mohamed Bouazizi, an unemployed college graduate, set himself ablaze after police confiscated a fruit cart that was his source of income. He died early this month. More than 100 people were killed in protests that followed over the past five weeks, according to the U.N. Office of the High Commissioner for Human Rights. The fatalities include victims of live fire, suicides and weekend prison riots. Protesters have denounced the wealth and corruption of Ben Ali and his family. Swiss authorities have put a freeze on assets belonging to Ben Ali and his "entourage," according to the Foreign Ministry website. The Swiss goal is to "avoid any possible risk of embezzling" Tunisian state assets. The rallies in Tunisia, one of the Arab world's most secular countries, have ignited unrest in the region, including in neighboring Algeria, where crowds took to the streets last week to protest food prices. State-run media reported at least three people had died in those clashes. And in Egypt, several people have set themselves afire in public this week, echoing the protest that triggered Tunisia's demonstrations in December. Juan Cole, a Middle East historian at the University of Michigan, said the Tunisian uprising is the most successful revolt in the region since the 1979 toppling of the shah in Iran. CNN's Ben Wedeman, Tommy Evans and Saad Abedine contributed to this report.